The Milwaukee County Zoo successfully hatched a cinereous vulture chick on May 26, 2015. The chick was born to parents Poseidon and Tritan. The chick is a male and has been named Torgos. 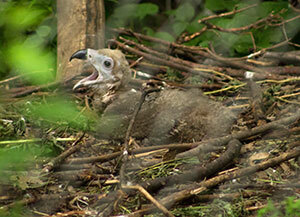 This hatching is significant to the captive cinereous vulture population. Poseidon and Tritan are a highly recommended breeding pair due to their genetics. However, several previous attempts by Zoo staff to get the pair to breed in their Winter Quarters holding area were unsuccessful. This past fall, Zoo staff decided to move Poseidon and Tritan to a new location for the winter. The pair was moved to an outdoor barn late in the year. They managed to build a nest in March, near the end of the breeding season. Although it was unlikely, the pair laid an egg, and it was fertile. Their keepers have reported that both Poseidon and Tritan have been excellent parents since Torgos was hatched.